On this home page, I'll introduce myself and talk about my reasons for wanting a web site. Here you'll learn all about me, my interests, my business, the people in my family, and more. This site has a little info and few pictures that I especially like. I've even included a tab for the list of my favorite links to other sites. First of all, for people who don't already know me my name is Kathleen. I am a stay at home mom with 7 kids. I am married to a wonderful man, Patrick, who is extremely supportive of everything I choose to do in my life. I run a home business, I love to read and learn anything new especially about computers, psychology and law. I enjoy taking courses at the nearby community college and I wanted this website so that family and friends can keep up with me and my family and keep in touch because we are spread out all around the country. I also wanted to get the word out about my businesses. 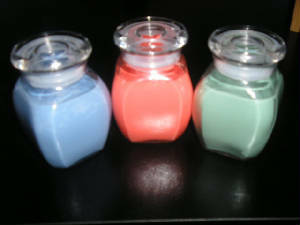 I am making safe, all natural, non-toxic candles in my home and I sell stuffed animal kits. I am very exicted about it and what to reach as many people as possible. For anyone who is interested in doing the same thing I can show you how or give you all the info. You will find various links around this site to help you reach me for more information and also to my personal e-mail and phone if you just want to catch up. You can click on some of my pictures too and be directed to one of my other sites. Hope you enjoy my site and thanks for viewing and supporting my family. Pat and I are celebrating our two year anniversary. Kids are growing like weeds and I am becoming successful in my home business. Here are the birthdays and events we have coming up this month. May 11th is Mother's Day and my brother David's 23 birthday is May 13. He will be graduating college this year. Make sure to check back here often for all the updates. This is where I will post all the birthdays for the month and anything else new and exciting. If you want to see your birthday or event listed contact me. Some of my candle creations! !